What is the Mingshi Scenic Area? 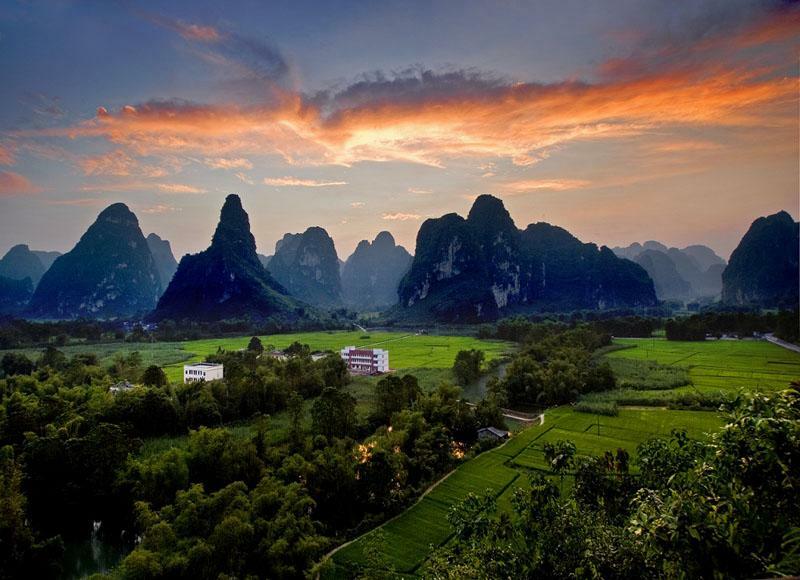 The Mingshi Scenic Area offers karst landscape, including green hills, rivers,caves, and natural murals on the cliff along with Zhuang minority villages and rice fields in the only one area. Mingshi Scenic Area offers similar landscape to the Li River in the Yangshuo countryside and Guilin Area while it has Zhuang minority villages. It is an integration of caves, villages, bridges, fields, green hills in different shapes caves and other natural scenery in the area. Mingshi River (明仕河) flows through this area for 8 kilometers. Visitors can admire the green hills, caves and natural murals on the cliff. In addition, they also can enjoy bamboo rafting, Zhaung singing and dancing performances, and the amazing sunset there. Visitors can appreciate its landscape on a bamboo raft on the river winding through the rice fields and quiet villages. The tour guide on the bamboo raft will offer the interpretation service for free. Visitors also can ride a bike from a hotel or a farmhouse through the area to enjoy themselves. The hotel or the farmhouse will offer a map of the cycling route in the area. If interested in Zhuang houses, visitors can explore the Zhuang Houses Museum (壮族民居博物院) in the downstream of Mingshi River. Visitors can purchase the ticket for bamboo rafting at the museum and then take a shuttle to the starting point of the rafting. The bamboo rafting lasts for 1 - 1.5 hours. If visitors want to enjoy the quiet evening in Mingshi Scenic Area, they can choose one accommodation to stay overnight. There are several types of accommodations there, including Mingshi Mountian Villa (明仕山庄,equal to 5 star hotel) and Daxin Mingshi Art Hotel (大新明仕艺术酒店, equal to 3 star hotel). There are also several homestays in the villages offering visitors a chance to experience the local life. If you are planning to visit Mingshi Scenic Area for photography purposes, the best time to visit is from April to October. From mid-April to early May, you will see many locals growing rice in the fields. If interested, you can join them. From the end July to the early August, rice has turned yellow and ripe and you also can see many villagers harvesting rice by hand. If interested, you also can experience the farming activity with them together. Yellow rice in the fields create a stunning view ideal for photography. Rent a vehicle departing from either Nanning or Daxin. This is the quickest and most direct option. If you depart from Nanning, take a bus from Langdong Bus Station (琅东客运站), Xixiangtang Bus Station (西乡塘客运站), and Jiangnan Bus Station (江南客运站) in Nanning city to Daxin County. Then, take the tourist shuttle bus with the route of “Daxin - Mingshi - Detian” (大新 - 明仕 - 德天). The shuttle runs every 40 minutes. You can also take the tourist shuttle bus with the route of “Nanning - Mingshi - Detian “ (南宁 - 明仕 - 德天) directly from Nanning to Mingshi Scenic Area. The shuttle offers 1-day itinerary and 2-day itinerary. The 1-day itinerary shuttle departs from Nanning Mingyuan Xindu Hotel (南宁明园新都酒店) at 07:00 every morning and returns back to Nanning from Mingshi or Detian at 16:00. As at 19th June 2018, the ticket for the round-trip for the 1-day itinerary is 99 CNY per person including the admission to either Mingshi Scenic Area or Detian Great Waterfall, the round-trip transportation and service of the tour guide on the shuttle. The 2-day itinerary shuttle departs from Wanxiangcheng Stop (万象城站) at Nanning Airport Terminal at 12:30pm every Tuesday, Thursday and Saturday. The shuttle returns back to Nanning from Mingshi Scenic Area at 11:00 next day. The ticket includes the admission to both Mingshi Scenic Area and Detian Great Waterfall, the round-trip transportation and service of the tour guide on the shuttle. For the latest pricing information, please contact us via email (info@wendyweitours.com). If you depart from Daxin County, take the tourist shuttle bus with the route of “Daxin - Mingshi - Detian” (大新 - 明仕 - 德天). The shuttle runs every 40 minutes. If you are interested to enjoy its quiet nightlife and explore the Zhuang life in the area, it is suggested that you stay overnight in Mingshi Scenic Area. As at 19th June 2018, entrance pricing is 120 CNY per person. For the latest pricing information, please contact us via email (info@wendyweitours.com). Interested in visiting the Mingshi Scenic Area on a Tour? Wendy Wei Tours offers a variety of different packaged tours as well as custom tours including the Mingshi Scenic Area, among other attractions and destinations. To find out more, please visit our Tours page or Contact Us directly to find out more.